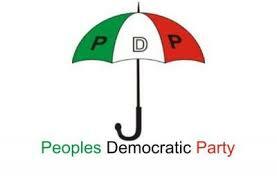 The Peoples Democratic Party, PDP, has disassociated itself from all those indicted by the Economic and Financial Crimes Commission, EFCC, in the alleged diversion and theft of about $2.1 billion arms money. In a communique issued by the party’s body of national vice chairmen on Wednesday, at the end of a meeting in Abuja, the party expressed support for the Muhammadu Buhari-led administration’s campaign against corruption. Some PDP members, and people who held office when the party was in power, are facing corruption charges for allegedly diverting money meant for purchase of arms for the fight against Boko Haram. Among those arraigned are, former National Security Adviser, NSA, Sambo Dasuki, a former minister of state for Finance, Bashir Yuguda, and a former director of finance at the office of the NSA, Shuaibu Salisu. The PDP said the eradication of corruption was paramount for Nigeria’s development, and called for the commencement of investigations into allegations of financial misappropriation, involving serving public officers. It expressed concern over the various cases of financial misappropriation currently under investigated, and called on the Buhari administration to leave no stone unturned in eradicating corruption in Nigeria. “That the PDP as a party dissociates itself from any of its members so indicted,” said the statement signed by the body’s secretary, Cairo Ojougboh, who is also the national vice chairman of the party (South South). “That any member so convicted shall also face intra party disciplinary action and will be severely sanctioned accordingly. “That the principle of the Rule of Law which was a cardinal focal point of the party while in government remains sacrosanct and immutable,” said the party. The PDP claimed its corrupt members have since left the party and frowned at what it described as the tagging of the party as corrupt. “We make bold to say that those who are corrupt have left the party and those who left are indisputably mercenaries and soldiers of fortune”. “That the vast majority of PDP members at the grassroots are innocent and not corrupt and accordingly we frown at and reject the notion and tagging of the PDP as a corrupt Party,” it said. The party also said that it remains an important element for Nigeria’s progress and unity. “Nigerians will realize in the very near future that the PDP remains the only viable choice for the Progress and Unity of Nigeria,” the party said. The communique said the PDP holds in high esteem the ideals of the G-34 founding Fathers of the Party, and called on its members to stay focused, saying that efforts are on the way to ensure a proper repositioning of the party. The PDP also said the days of mediocrity in the party was over, and that power would return to the grass roots.